Barton: "We walked up into the stadium seating and sat basically in the center." Barton was shot in the neck, struck by shrapnel on his right arm and chest, and his face was cut up. Debris was removed during surgery. I feel so sorry for Jamison Toews. He was not able to tell his story at all. He got so flustered and tongue tied. He didn't even know what to say every time Spengler said "objection". When he started to speak again, he seemed frustrated about what to say. He walked out of the court room with his head down and his shoulders hanging. Shame on Spengler for not allowing the guy to even speak. Poll suggestion: Will PT put Ashley Moser on the stand before Dr. Fenton or as the last witness in their case. Does anyone know where Orman is today? We only have 1/2 of The Wonder Twins. Barton: "The room was starting to fill with smoke... I felt this immense pressure on my chest, basically my whole upper body, and I fell forward." Barton: "I couldn't feel my left arm at all. It was completely numb." Said he had to look to make sure it wasn't blown off. I think they are working on getting ready for Dr. Fenton. Ah I hadn't noticed.....where is Orman? @Utah That happened to Kevin Campbell as well. he was sitting next to Micayla Medek and tried to pull her out of the theater and was objected to all over the place. Barton: "All along there was this booming noise, it kept going... I was sitting in my own blood. Petra was screaming. Ethan was screaming." He was with the first person that called 911 during the shooting. I can hear the booming noise from memory of that call; can't imagine his terror that night. Mr. Toews's testimony brought tears to my eyes. How horrendous, I wonder if the jury felt the same horror. Who was the one who is paralyzed? @Chipper: Me too, I wouldn't be able to contain myself even if I was on a jury. Spenglers not even looking at the screen of his injuries. SMH. 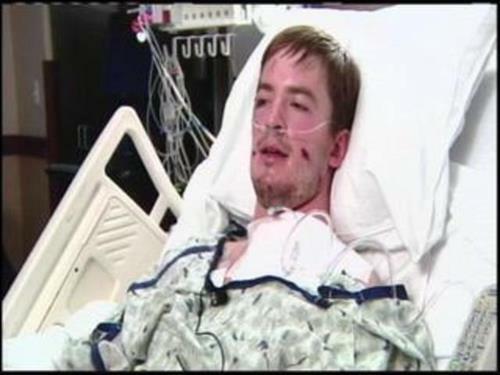 Barton was shot in the neck, struck by shrapnel on his right arm and chest, and his face. 8 pellets remain in his body. Prosecution calls FBI Agent Christopher Rigopoulus back to the stand. There were shotgun pellets left in a lot of people. If anyone out there has medical knowledge and can explain the reason why, I would greatly appreciate it. Is this the FBI agent being called back? @Tammy I can't remember the paralyzed guy's name, but he was at the stand early on. I am not sure if you were with us back then. Is he laying foundation for Dr. Fenton's testimony? The defense is trying to get through all the testimony by the end of the week. Oh snap!! Ormans on point!! I think God is with Mr. Toews..I dont think I could have had his composure sitting across from JH. I think I would have gone temporarily insane and hurt JH so badly he would have to eat out of a feeding tube for the rest of his life. I think everyone is waiting for Dr. Fenton's testimony. I think I know who that is, Doc, but there was a woman too, I thought. Was that a pic of JH's hair? Idk what that picture was! The People Call Dr. Fenton!! I think the guy you are talking about is the husband of the woman who was 9 months pregnant. She saw he had been shot in the head and thought he was going to die and needed to save her baby because it was all of him that she would have left. While he was in surgery, she went into labor. Tammy, it was Jamison Toews girlfriend, Ashley Moser, who was paralyzed. She was pregnant with Jamison's baby. Tragically she lost the baby as a result of the shooting. She is in a wheelchair now. She and Jamison aren't together now, and Ashely lost both of her children -- Veronica who died at the scene, and her unborn baby who she lost. Hers is a very tragic story. In fact, most are very tragic stories. Good Morning Folks! Hope I didn't miss too much. What did he ask the FBI Agent? That was fast.